Cotton plays a big part in every human’s life. We wear it, we dry ourselves with it, we sleep on it, we even walk on it, and our kids may play with it. Cotton is found in clothing, home furnishing, kids products and toys, sanitary products and also footwear. Cotton is the most used natural fiber for clothes and accounts for around 20 % of fibers used for textiles. It has been used since at least 5000 B.C. We know this since fabric fragments have been found in Mexico, Pakistan, and Peru. Even though cotton is steadily losing market shares to synthetic fibers, its market is huge. The annual global production of cotton is 25 million tonnes. Organic cotton only makes up less than 1% of this. More on organic cotton below. Cotton is the world’s largest non-food crop, grown for trade by more than 80 countries. The largest cotton growers are China, India, USA, Pakistan, and Brazil. These countries produce 80 % of the world’s cotton. The natural fiber of cotton can be woven or knitted to produce soft and durable fabrics that also are recyclable and biodegradable. It is a widely popular fiber that can be turned into a wide range of fabrics, e.g. jersey, denim, flannel, lawn, muslin, organdy, percale, pima, twill, and velvet. Cotton can be used alone or blended with other fibers such as polyester to improve durability. When mixed with elastane it creates stretchy fabrics. You might hear that products are eco-friendly, or sustainable but that doesn’t mean anything unless the cotton product itself is certified to an organic cotton standard. There are three types of cotton; short staple, long staple, and extra long staple. The short staple fiber is thick and short with elasticity. It is grown in the USA, India, and Pakistan. 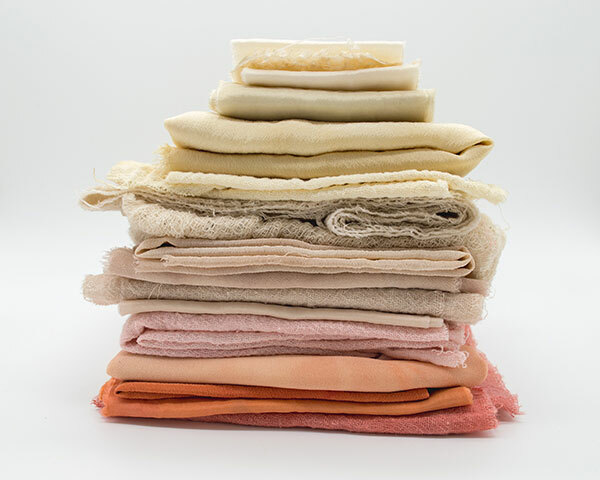 It is typically used for futon cotton and absorbent cotton. Long staple. The long staples consist of over 90 % of the world’s cotton production and are grown in, for example, the USA, Mexico, Brazil, Central Asia, China, Pakistan, and Australia. It is used for clothes and towels. Extra long staple. This fiber is long and glossy and used for thin fabrics. It is grown in, for example, the West Indies, Egypt, and Peru. Cotton comes from the bolls of the cotton plant. The bolls are fluffy fibers that surround the seeds. The bolls are de-seeded, cleaned and carded, then spun into yarn. The yarn is woven or knitted into fabric. This entire process is done in different locations and involves shipping and in most cases dyeing and printing. Optimal growth requires dry warmth, sunshine, regular irrigation and protection from pests and weeds. More than 20 000 liters of water is needed to produce 1 kg of cotton. More than half of global cotton production takes place in areas under high or extreme water stress. Only one-third of the cotton produced comes from rain-fed farming. The rest relies on irrigation, mainly wasteful flood irrigation, putting a strain on the environment. Cotton is one of the most chemically dependent crops in the world. Farmers use herbicides, fertilizers, and insecticides. These inputs can pollute local eco-systems and drinking water supplies. The heavy usage of chemicals has devastating effects on the people working on the fields, their children, and those living in the farming areas. 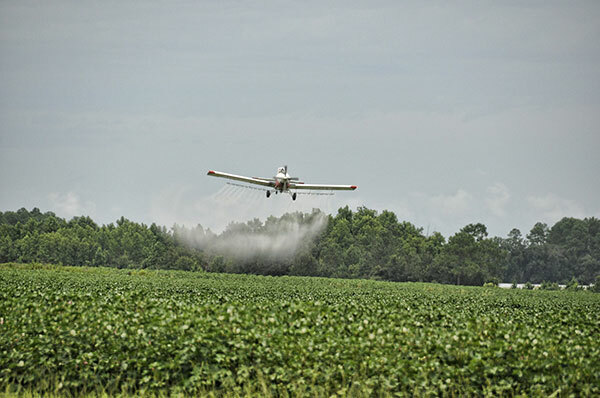 A crop duster plane is applying pesticides on cotton crops. The cotton industry is a cornerstone in many low- and middle-income countries. Most cotton farmers are cultivating small plots and the industry provides work and livelihood for around 350 million people. Read more about fashion’s impact on the environment here. Organic cotton is produced and certified to organic agricultural standards. Its production considers the soils, ecosystems, and people by using natural processes rather than artificial inputs. Organic cotton farming does not allow the use of toxic chemicals or GMOs but combines tradition, innovation, and science to benefit the shared environment and promote a good quality of life for all involved. A lifecycle analysis of organic cotton published in 2016 found that organic cotton had half the global warming potential of conventional cotton, 91 % less use of fresh water from lakes and streams and approximately a third of the demand for energy. No toxic chemicals are used in the growing of organic cotton. It doesn’t damage the soil in the same way, has less impact on the air, and uses much less water and energy. Conventional cotton uses a lot of insecticides and pesticides that organic cotton is not using. Organic cotton is 80% rain-fed, which reduces pressure on local water sources. The absence of chemicals also means that water is cleaner and safer. Organic is only one way to go for sustainability. 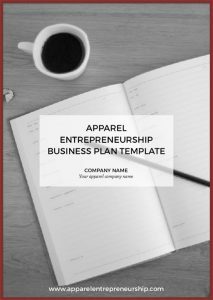 Read also 9 Steps to Become a Sustainable Apparel Brand here. 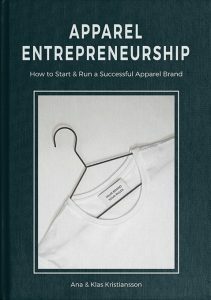 Creating a sustainable apparel brand involves many other steps, such as lowering the consumption, making high-quality garments, and educating the user on how to treat, wear, and wash the clothing (laundry uses both a lot of water and energy). To stay on the topic of this post, using organic cotton is a first step to supporting organic farming practices. To support sustainable practices along the entire supply chain, from the cotton plant all the way to a garment hanging in a store, you should look at the GOTS certification. More on GOTS below. 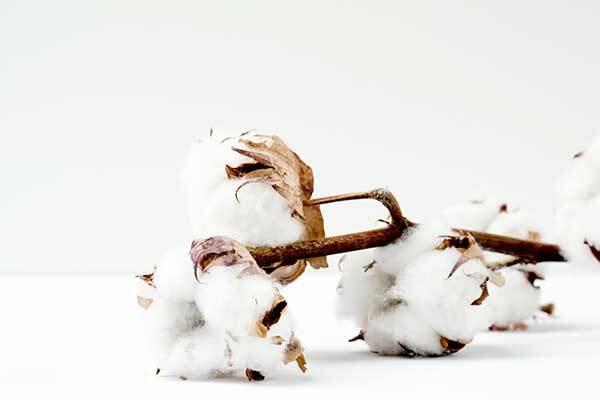 How to find organic cotton. To source ethically and sustainably produced cotton, you can look for the following initiatives below. Organic cotton is produced and certified to organic agricultural standards. The symbol indicates that the product has met specific social, environmental and economic criteria that support the sustainable development of small-scale producers and agricultural workers in the poorest countries in the world. The Fair Trade organization essentially gives consumers the opportunity to help reduce poverty and instigate change by purchasing Fair Trade cotton and several certified food items. It exists to respond to the current impacts of cotton production worldwide. BCI promotes measurable improvements in the critical environmental and social impacts of cotton cultivation worldwide to make it more economically, environmentally and socially sustainable. Indicates that the product is definitely organic through every stage of production from ginning to the labeling of the final product. This includes all aspects of manufacturing from use of biodegradable and toxin-free dyes, to low impact waste treatment and water supply systems in factories, fair labor practices and final products that are free of allergenic, carcinogenic or toxic chemical residues. This officially and internationally recognized standard is currently one of the most trusted organic textile certifications. To learn more about sustainable standards, organizations, and certifications, take a look at the Apparel Entrepreneurship Sustainability Certification Guide here. In the Member Zone, you can search and find organic cotton suppliers in our Database with 280+ companies worldwide. How to run a sustainable apparel brand (including a webinar).